Q. I need help using iCollege! How do I find my classes, get help with problems, etc? 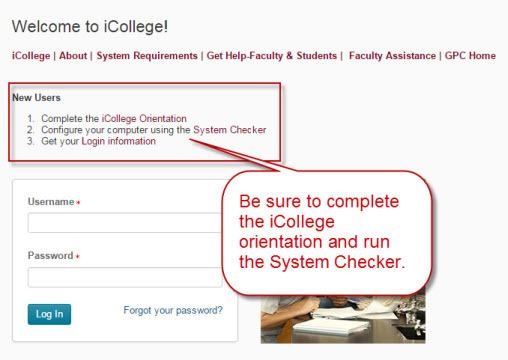 For normal iCollege operation, including how to find your classes, be sure you watch the iCollege orientation video, linked from the iCollege login site. On that same page, there are links to a System Checker and log in information. For problems related to iCollege, contact the GSU Help desk by email or by calling 404-413-HELP (4357). You can also call the D2L Service desk (open 24/7) for issues related to D2L (the iCollege software). The D2L Service Desk cannot help you with issues that are specific to GSU computers, iCollege settings, or add-ons, such as the Respondus Lockdown Browser. Most difficulties with printing documents from iCollege can be solved by saving the file to your computer or a flash drive, then printing from that file rather than printing directly from iCollege.